This is an advertorial for Sanghyowon Botanical Garden. While they don't get the atten-tion of some of our other attrac-tions, Jeju's native plants should surely be regarded as one of the island’s greatest treasures. The island is gifted with great diversity due to its southerly latitude and its combination of tropical and temperate habitats. Mt. Hallasan at its center even harbors polar species as South Korea’s tallest peak at 1,950 meters. Jeju has a wealth of habitats including wetlands, windy grass-lands, rocky cliffs and much more, creating the perfect conditions for more than 1,800 plant species many of which are extremely rare. 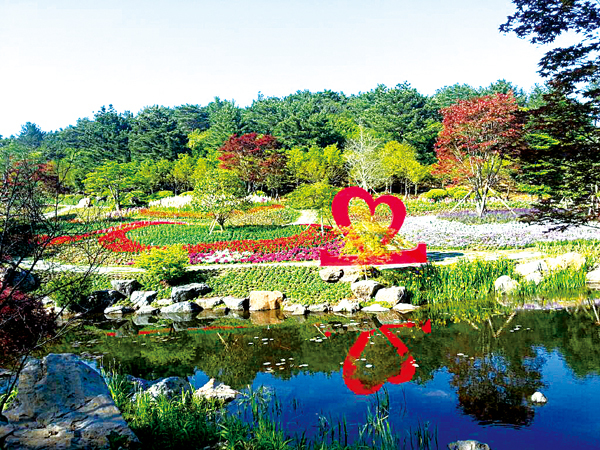 Although Sanghyowon Botan-ical Garden opened in April, work began 25 years ago on the 260,000 square meter site. All of Jeju’s natural landscapes and flora are represented and it’s a joy to see such botanic riches rather than the soulless tourist resorts springing up elsewhere. The garden not only increases access to Jeju’s fauna, but also gives detailed explanations for visitors wanting to know more about why the island is so special. The garden tour starts with “Mother’s Garden,” named by the founder himself. The flowers and plants here provoke nostalgia among Koreans, particularly the bongseonhwa (garden balsam) used by young maidens to dye their nails reddish orange following the rainy season in late July or August. Tradition dictates that if your pinky retains some orange by the first snow falls, you will marry your first love. In the eastern corner of the park there is a wide open area with two impressive 350-year-old pine trees in the middle. Resting your legs while hiding in the cool shadow of these elderly trees and enjoying a view of the southern coast is a great midpoint for your botanical garden tour. Further on there are a few ponds and flower gardens and it is worth getting up close to see the golden carp fish reflecting the sunlight off of their colorful fins. It is clear the fish, also known as Koi carp, love the attention — or the food — and will swim towards you at the water's edge. To make the park worth visiting throughout the year, the blooming flowers change appearance every season and are carefully arranged to beauti-fully showcase the seasonal colors. The Gusangnamu Café is at the highest point of the park and visitors can enjoy a refresh-ing drink and the Jeju tangerine smoothie is well recommended, cooled further by the light wind and amazing views. 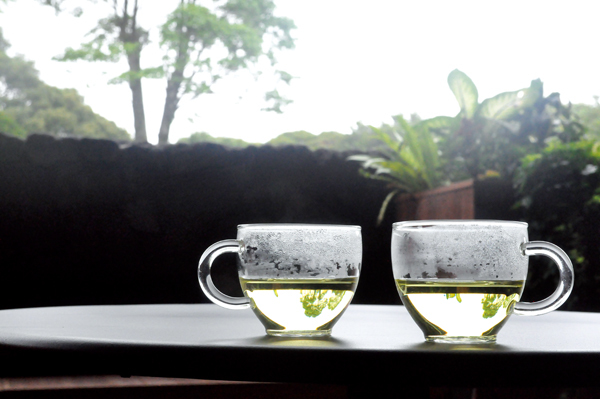 The cafe takes the name of the gusang tree, which locals claim is the original Christmas tree, originating on Mt. Hallasan. While every Islander knows this, it is yet to be appreciated worldwide. You can buy some handmade and wooden souvenirs in the little gift shop. The park also includes an area of “Gotjawal,” a forest that seems to grow out of the rock. The word comes from “got” meaning wood and “jawal” meaning rock, both in local dialect. As the island formed volcanically, such rocky habitats were the first places for oceanic winds to bring colonizing plants. Little by little, as soil accumulated, seeds and then seedlings took root. In this way a unique eco-system was born and adapted to the thin soils as tree roots spread over the rocks and water ran into underground aquifers. As the land was difficult to farm, such rocky areas, formed by lava flows from nearby volcanic cones, flourished for centuries, only coming under threat recently. Next to the “Gotjawal” is a natural stone garden, with little flowers blooming here and there on yellow dry rocks seem-ing to reflect the spirit and traditions of Asian philosophy. The cave-like features remind of sites of shamanic shrines that used to thrive across the island. In fact, before the garden was opened, a local shaman per-formed ceremonial rites here for prosperity. It should be said that Sang-hyowon is not only about enjoying nature and beautiful views, there are plenty of other facilities besides plants to enjoy. There is the orange orchard, for example, with rare plants among the trees. The children’s playground also boasts a huge bouncy dome, sure to captivate any child while the well-prepared parent enjoys a calm picnic with friends. Although not yet open, there is even a camping site for “autocamping” and tents, due to open by late-August. As you get back to the pyramidal building at the entrance (and exit), there is a high quality restaurant and hall for conferences, exhibitions or even just big get-togethers! 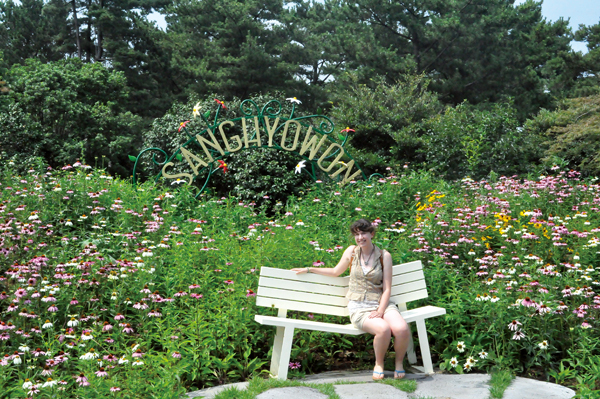 If you excuse the cliche, there really is something for everyone at Sanghyowon Botanical Garden. Tickets: 9,000 won (adults), 6,000 won (13-18 years), 5,000 won (children). * Group (more than 20 people) discounts available.